Fancy the full Aero Glass 3D experience in Windows Vista without forking out for a high end graphics card? 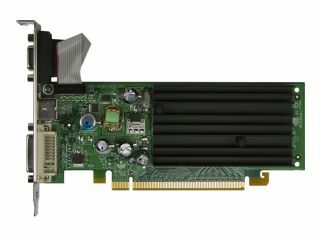 Then Nvidia 's new budget video board, the GeForce 7200 GS , could be for you. It's based on the same chip already seen in Nvidia's existing Geforce 7300 and 7500 video chipsets. Crucially, the 7200 GS delivers full hardware support for DirectX 9 and Shader Model 3. And that means you can enjoy all of Windows Vista's showbiz moves including transparencies, live previews and 3D window rendering. Nvidia also claims the 7200 GS is 50 per cent faster than the best integrated graphics solutions. But with integrated chipsets typically offering pretty pitiful 3D performance, don't get too excited. Indeed, despite the solid feature set, there is a snag. Compared with the 7300 and 7500 boards, half of the pixel pipelines and one of the vertex shaders have been disabled. As such, it's unlikely the new card will deliver a satisfying gaming experience. Thanks to the crippled 3D core, you can forget playing the latest and most demanding PC titles such as Stalker and Supreme Commander with the 7200 GS, for example. It makes most sense, therefore, as a budget video card for a home theatre or general workhorse PC rather than a gaming rig. The 7200 GS will be available with either 128MB or 256MB of DDR2 graphics memory. UK pricing has yet to be revealed, but Tech.co.uk guestimates this Vista-ready card could be yours for as little as £30.